We’re in Lisbon! With a population of 2.7 million, this is Portugal’s largest city; it’s also Europe’s second-oldest capital (after Athens), and was once home to great explorers like Vasco da Gama and Ferdinand Magellan. 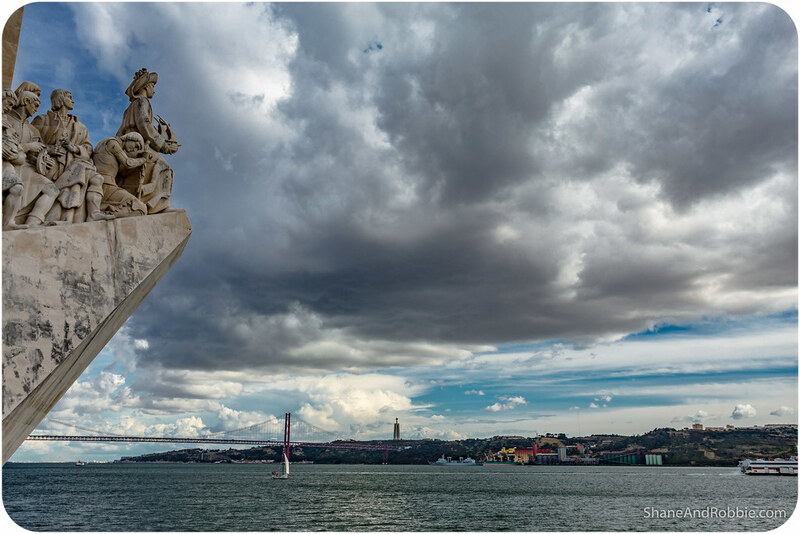 Perched on the edge of the Atlantic Ocean, Lisbon is built across 7 hills and sits on the banks of the Rio Tejo (Tagus River). 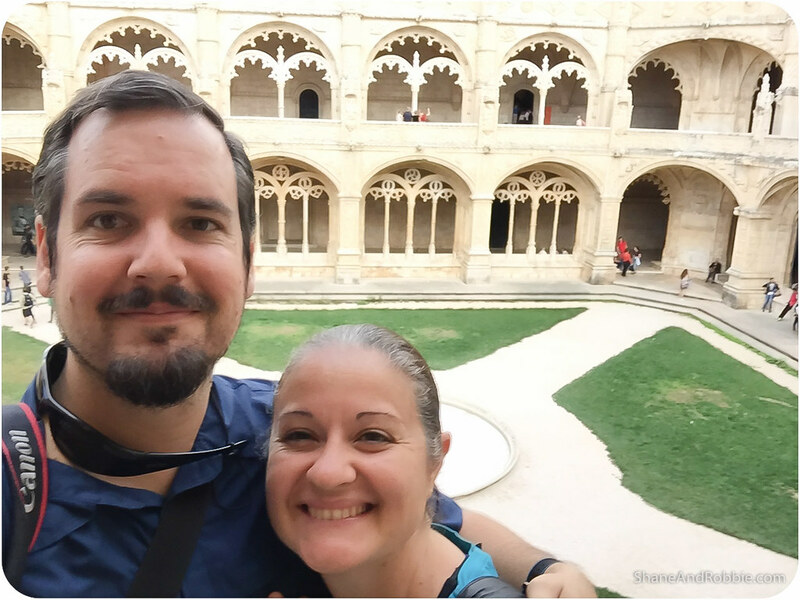 We arrived this afternoon and were instantly enchanted by the city’s white limestone buildings, epic Moorish castle, and unique cityscape. Not wanting to waste any time, went straight out to explore Belem, a waterfront suburb with a wealth of museums, historic sites, and beautiful vistas to enjoy. 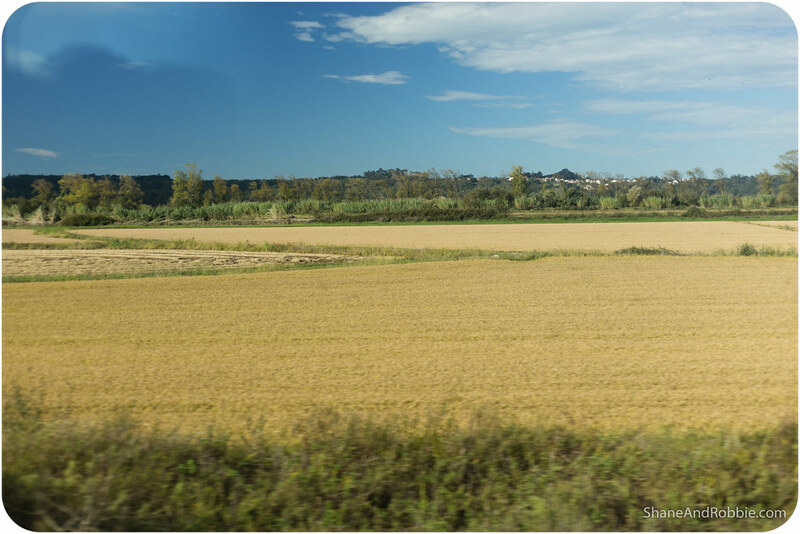 Our train ride from Coimbra to Lisbon was uneventful and comfortable, taking us through the central hills of Portugal to the Southern plains, and into the city of Lisboa, as it’s called in Portuguese. 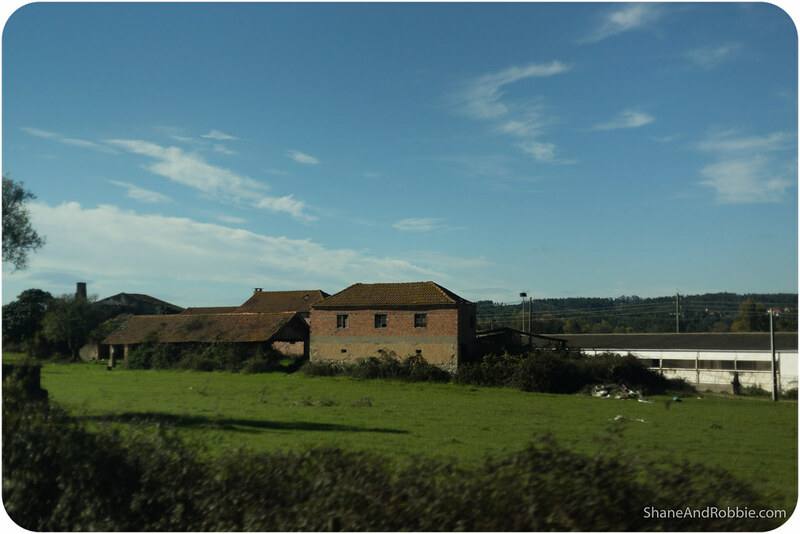 The views along the way were typically rural and rustic, with much of the land we passed forested and green. 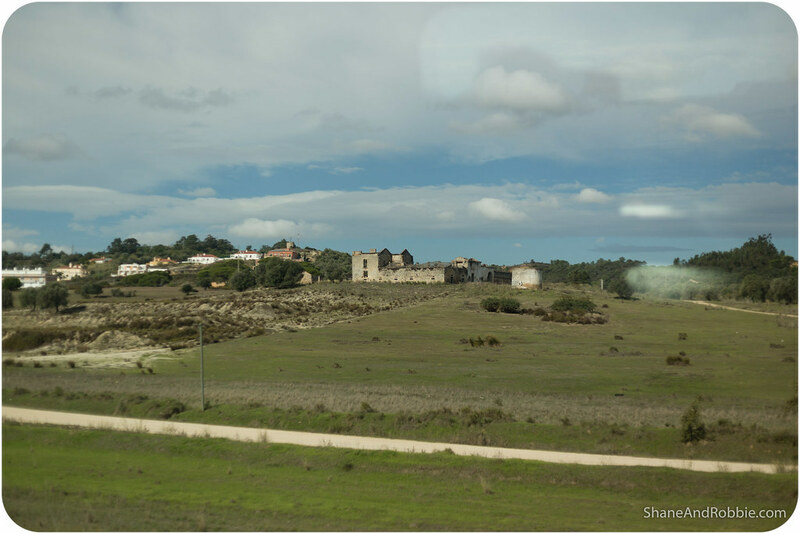 It was a short trip from Lisbon’s Santa Apalonia station to Praça da Figueira and the guesthouse we’re staying in. 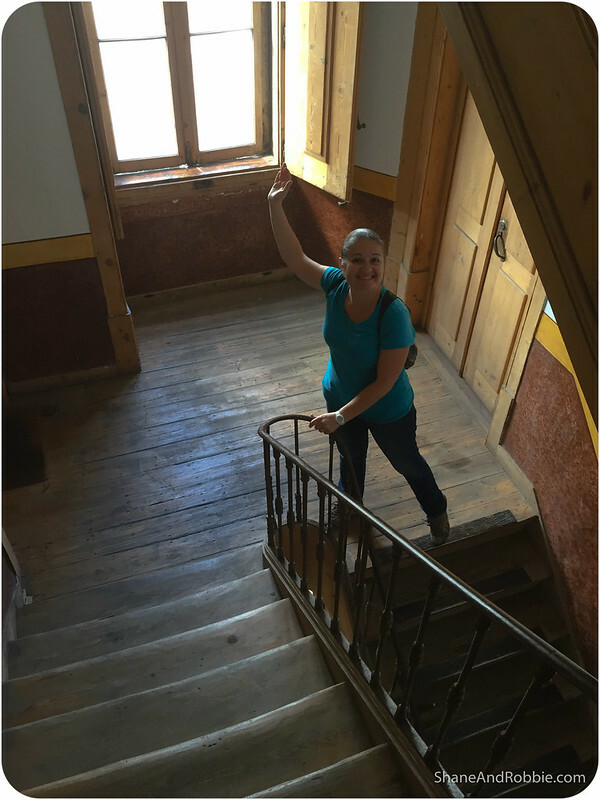 Our accommodation’s in an awesome spot (very central and convenient to everything), and being in an old 18th century building, has loads of character. We just love these boutique little places, with all their quirks and idiosyncrasies – much nicer than staying in chain hotels with their identical layouts and featureless rooms*. *We both used to travel a fair bit for work back in Aus and stayed in LOTS of those sorts of chain hotels, consequently we’ve developed a bit of a dislike for bland abodes. There’s nothing wrong with them really, it’s just that those types of hotels have no soul and, as predictable as their offerings are, we’re always left somehow unsatisfied from our sojourns there. We’d much rather find somewhere unique to sleep! After dropping our bags off and grabbing a quick lunch (Portuguese food: so cheap – so good! 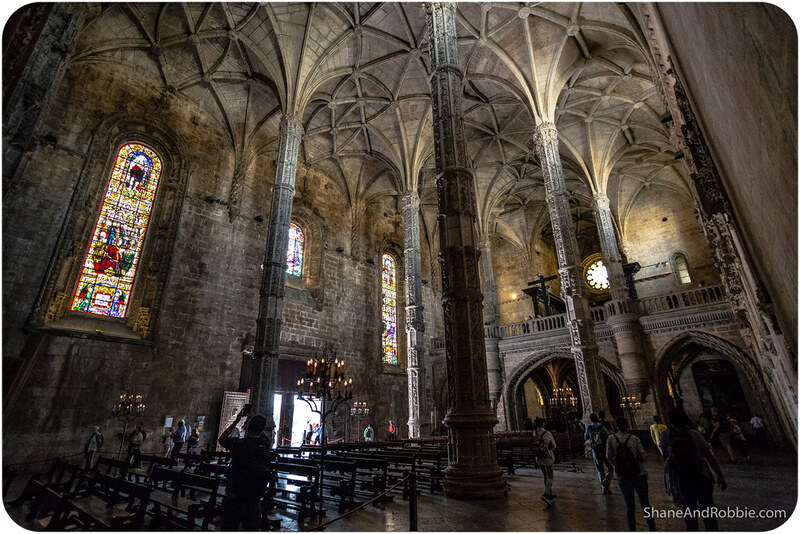 ), we headed 5km out of the centre of Lisbon to Belem. 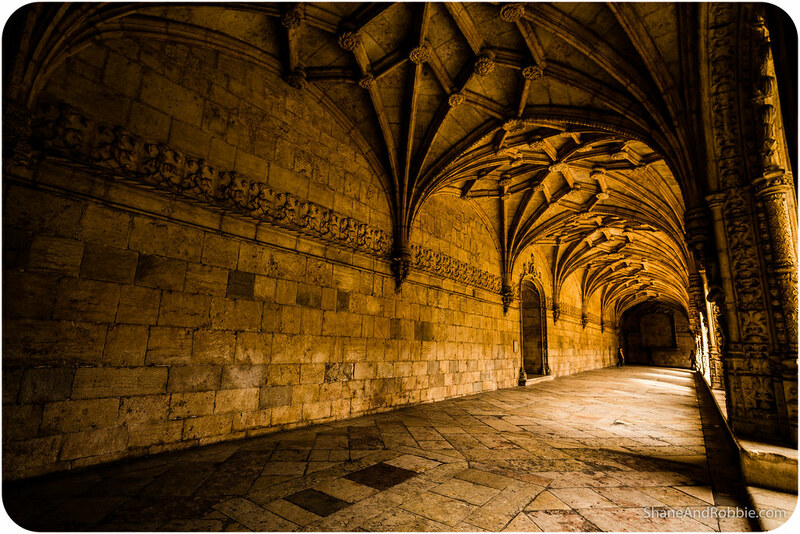 An outer suburb of Lisbon these days, Belem was once a port town famous as the launching point from which the great Portuguese explorers set off on their voyages of discovery. 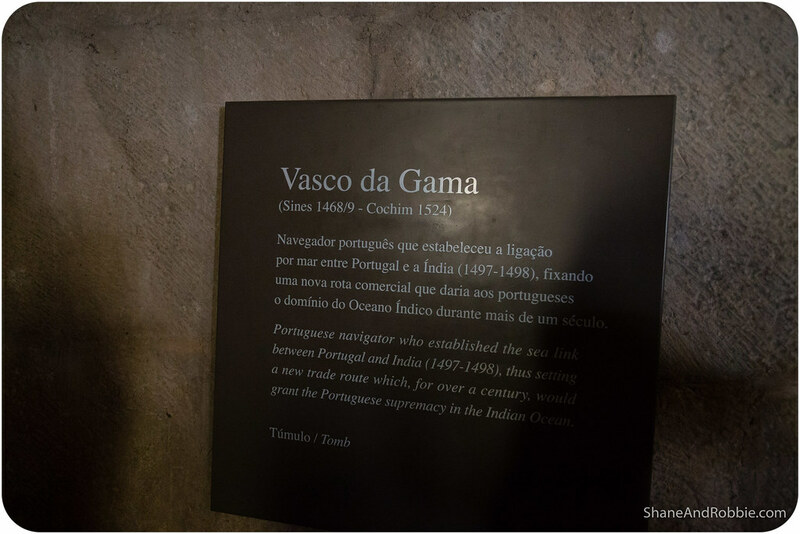 It was from Belem that Vasco da Gama departed for India in 1497 and Pedro Álvares Cabral departed for Brazil in 1499. The journeys of these great Portuguese explorers literally spanned the globe, staking claims in Africa, Asia, India, and South America along the way. 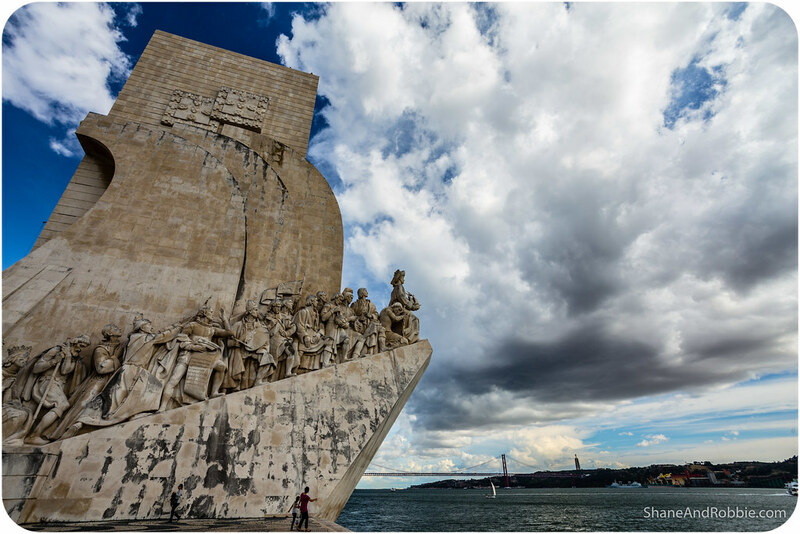 Even Columbus landed in Lisbon before returning to Spain after his famous 1492 voyage. 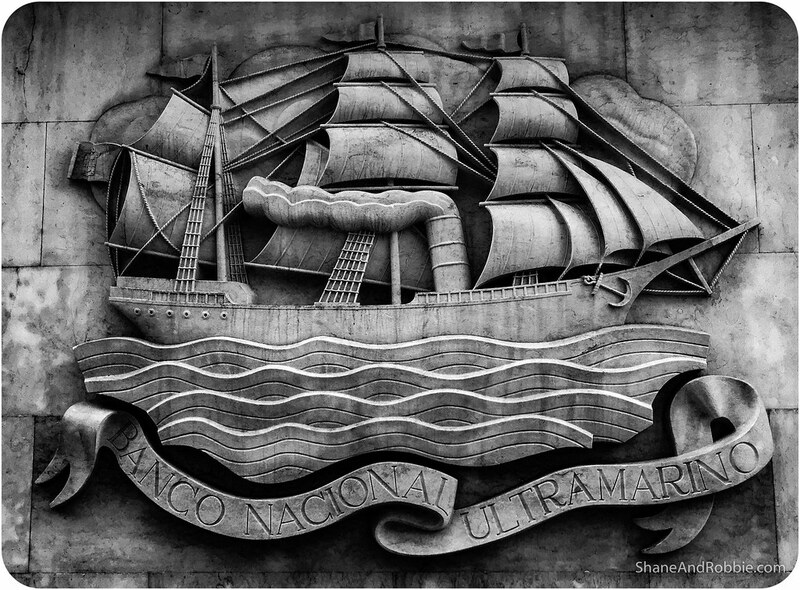 There’s a monument in Belem that was built In honour of these great explorers: the Padrão dos Descobrimentos (i.e. Monument to the Discoveries). 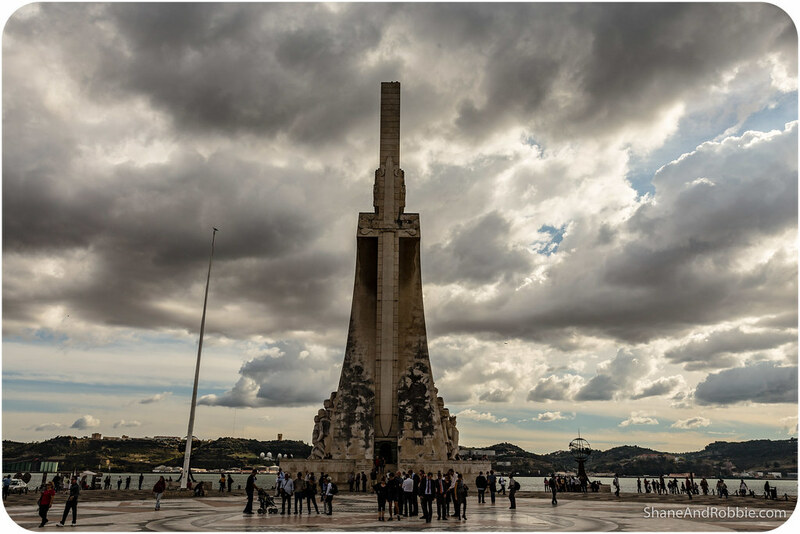 Built for the Portuguese World Fair in 1940 the monument is located exactly where ships used to leave from during the Portuguese Age of Discovery of the 15th and 16th centuries. 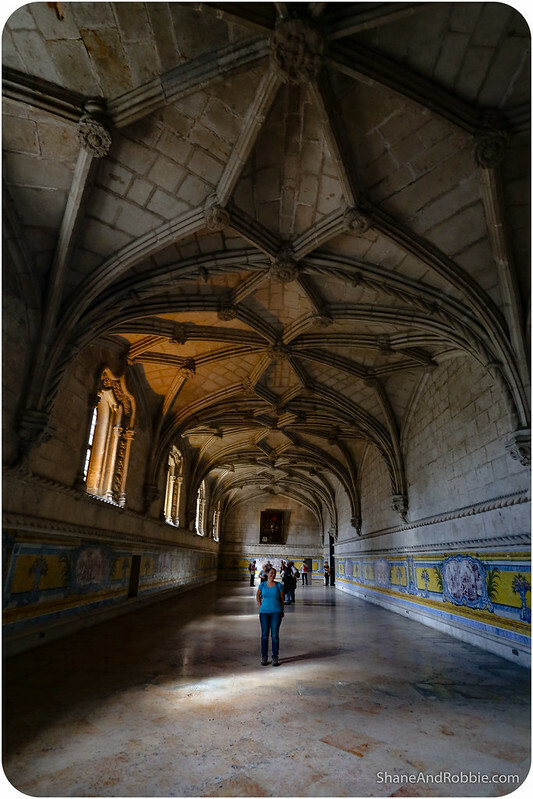 It’s certainly an evocative monument and made a great photo stop during our explorations of Belem. 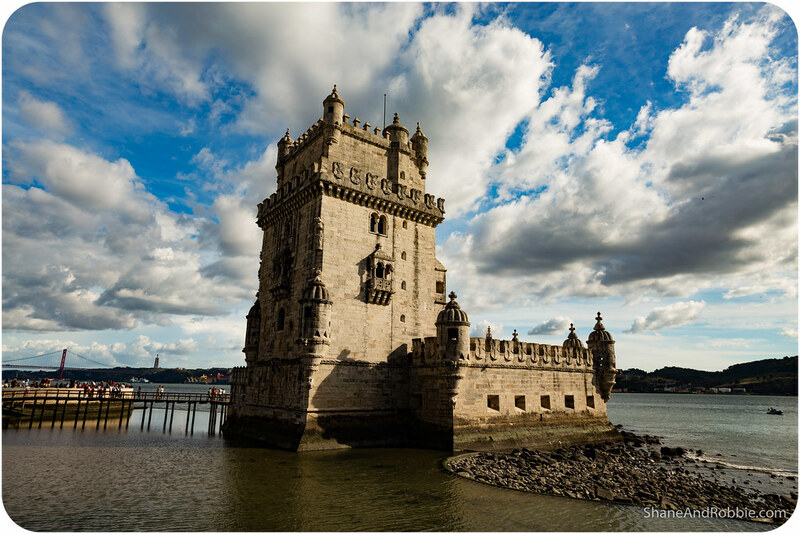 Not far from the Padrão dos Descobrimentos is Belem’s most famous feature: the Torre de Belem. This 16th century fortification is iconically representative of Lisbon and is always shown on billboards and in ads promoting the town. Built in the Manueline style, it incorporates Moorish influences with a number of different architectural style to create something quite unique. 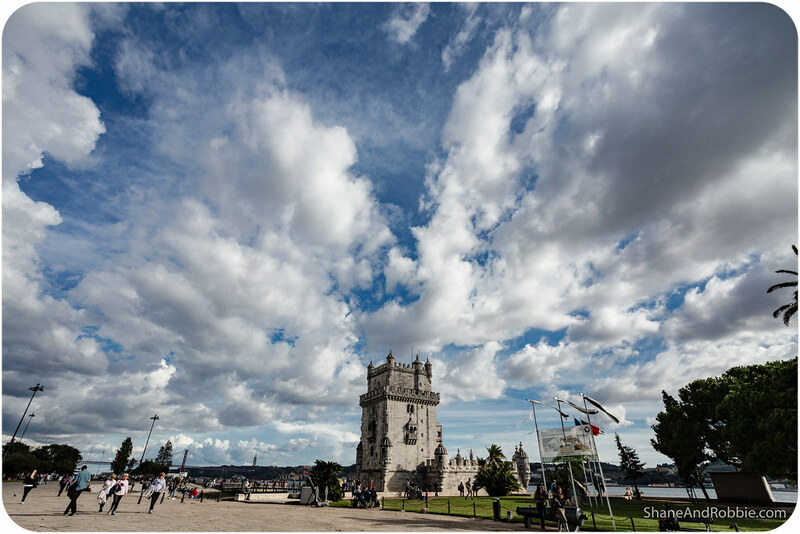 The tower was built in 1515 as a fortified lighthouse to guard the entrance to Lisbon’s port. 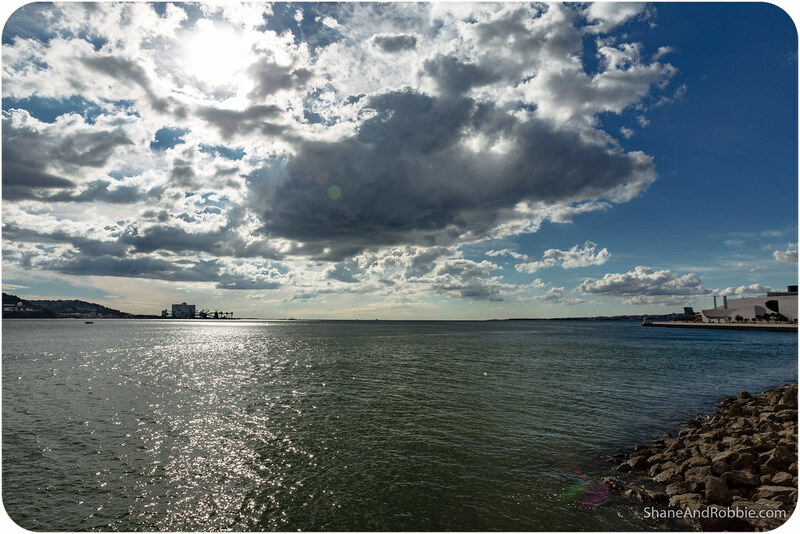 The tower became a symbol of the Age of Discovery as it was the last thing explorers would see as they embarked on their journeys and the first sign of home when they returned. 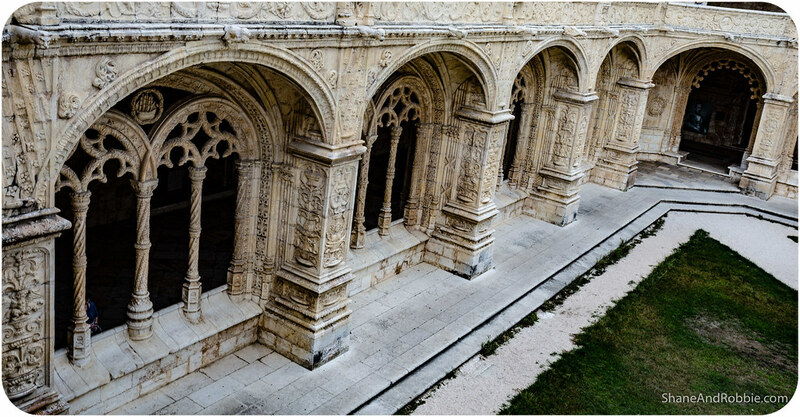 From the Torre de Belem it was a pleasant walk along the waterfront to Belem’s grandest sights: the Mosteiro dos Jerónimos (i.e. 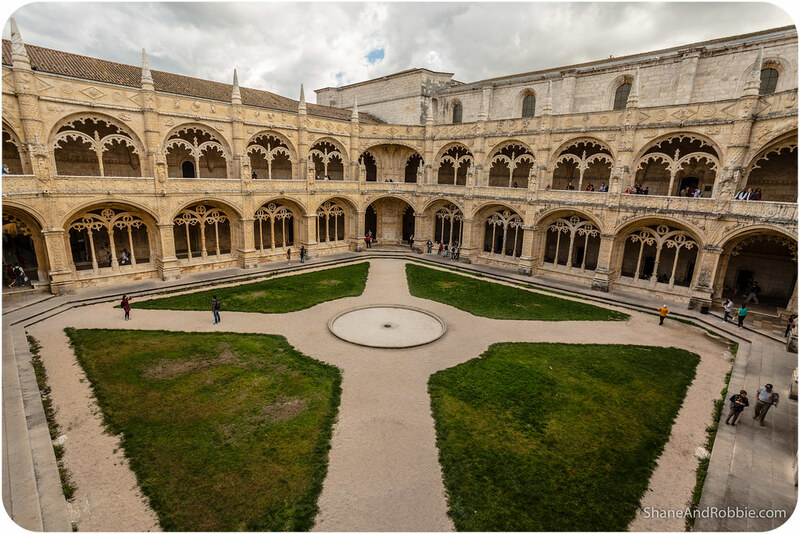 Jeronimos Monastery). 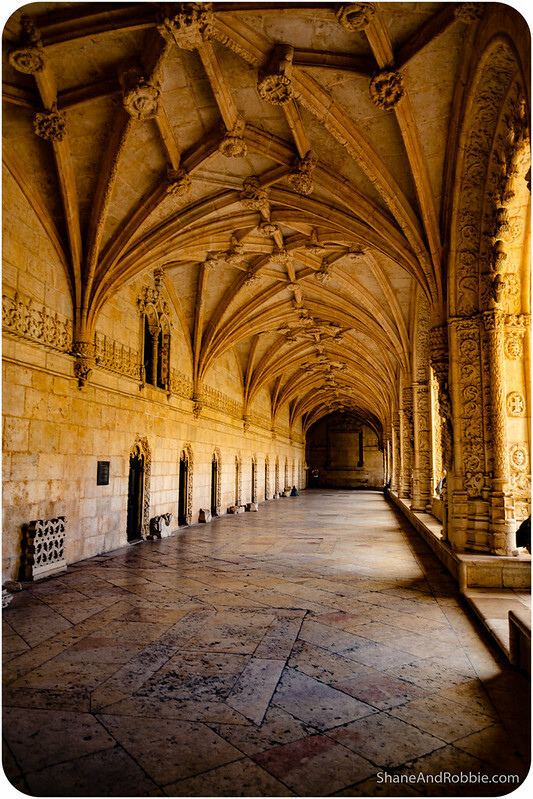 This majestic monastery is an impressive symbol of Portugal’s power and wealth during the Age of Discovery. 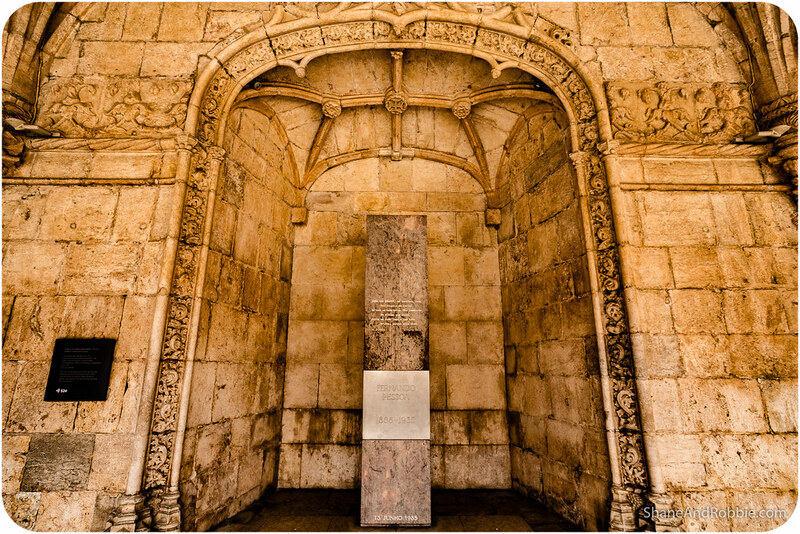 King Manuel I built it in 1502 on the site of a chapel where Vasco da Gama and his crew spent their last night in Portugal in prayer before leaving for India. 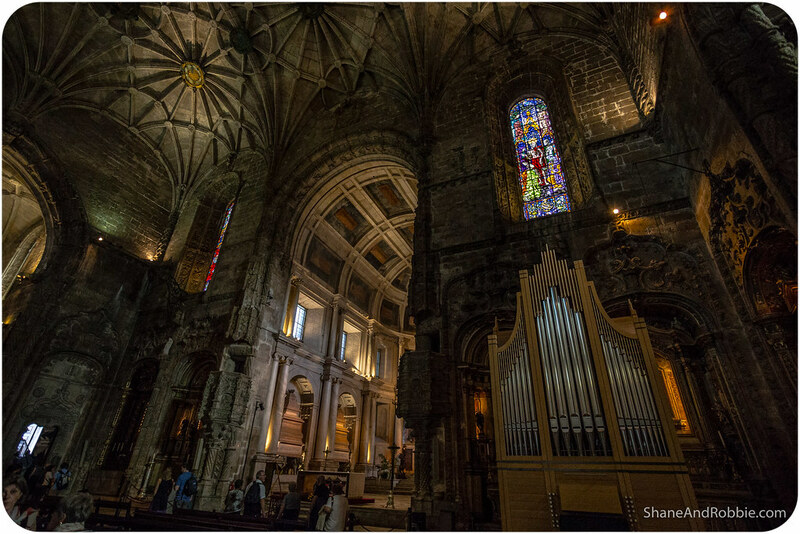 It was built to commemorate Vasco Da Gama’s voyage and to give thanks to the Virgin Mary for its success. The project was funded by wealth garnered from explorations in Africa, Asia, and South America, as well as a stiff tax imposed on the Portuguese-controlled spice trade with Africa and the East. 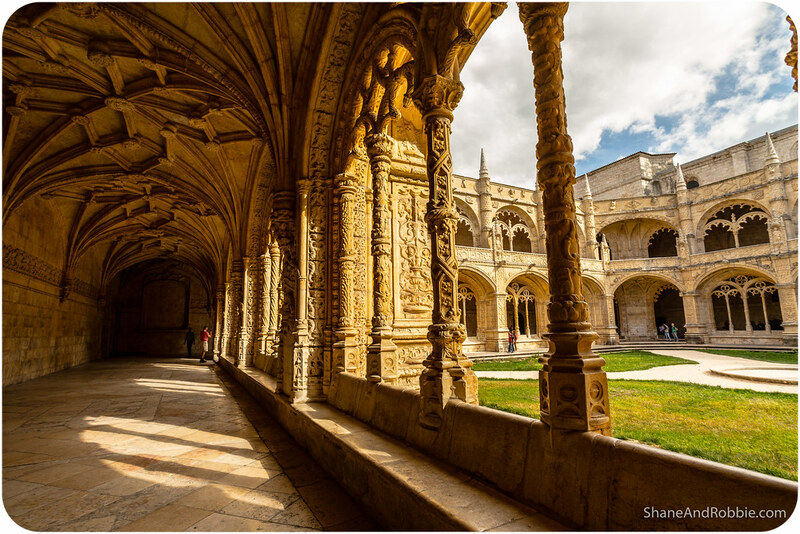 Like the Torre de Belem, the Jeronimos Monastery is a great example of Manueline architecture, a style unique to Portugal that combines Gothic, Moorish, and early Renaissance influences. The style is characterised by ornate detailing, delicately scalloped arches, and frequent use of natural and organic motifs. 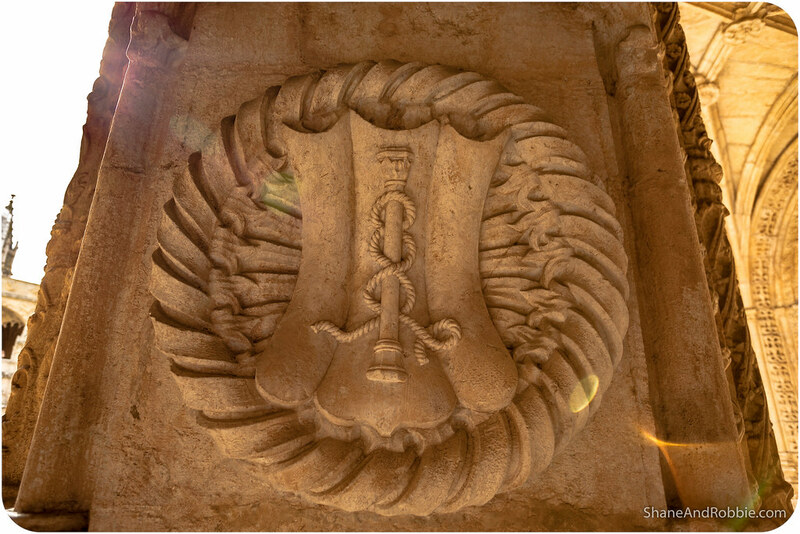 All of which were apparent in abundance in the cloister of the monastery. Attached to the monastery is a grand church dedicated to the Virgin Mary. 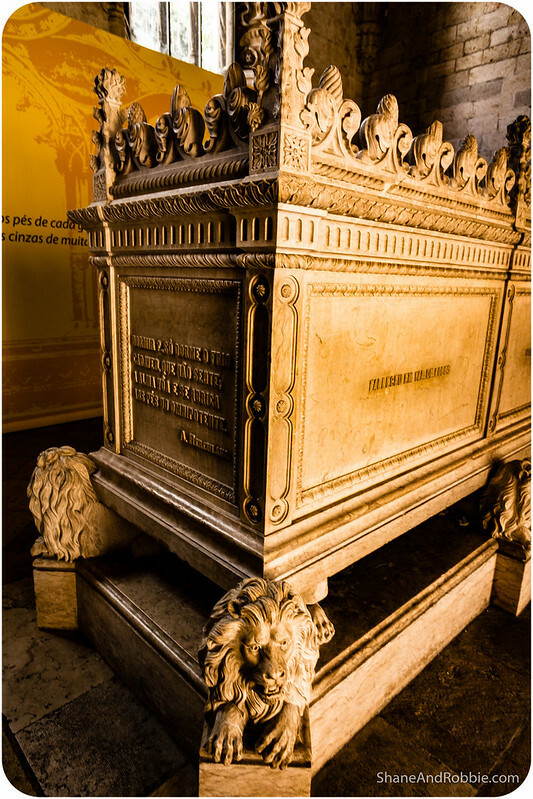 Within the church lie the tombs of King Manuel and other Portuguese royalty, as well as many important figures from Portuguese history. 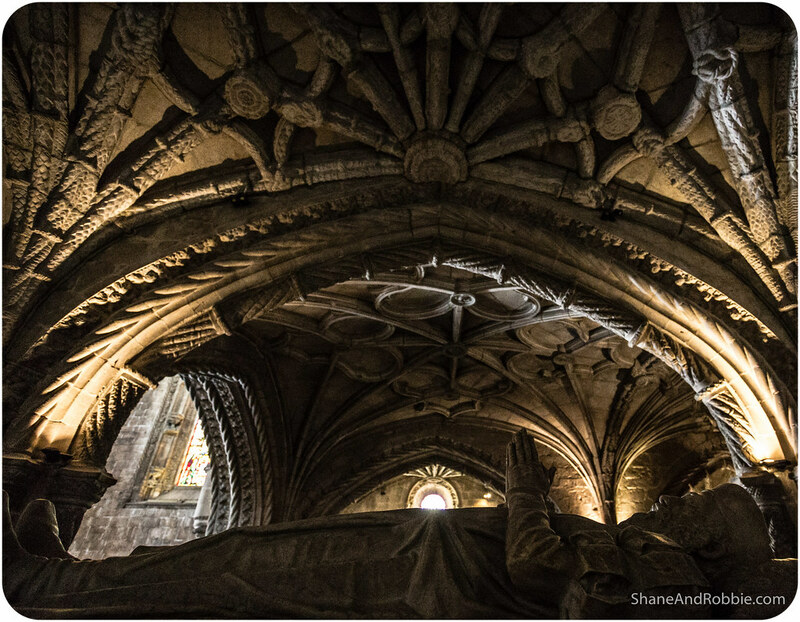 Most famous among these is Vasco de Gama, whose accomplishments at sea inspired the monastery. 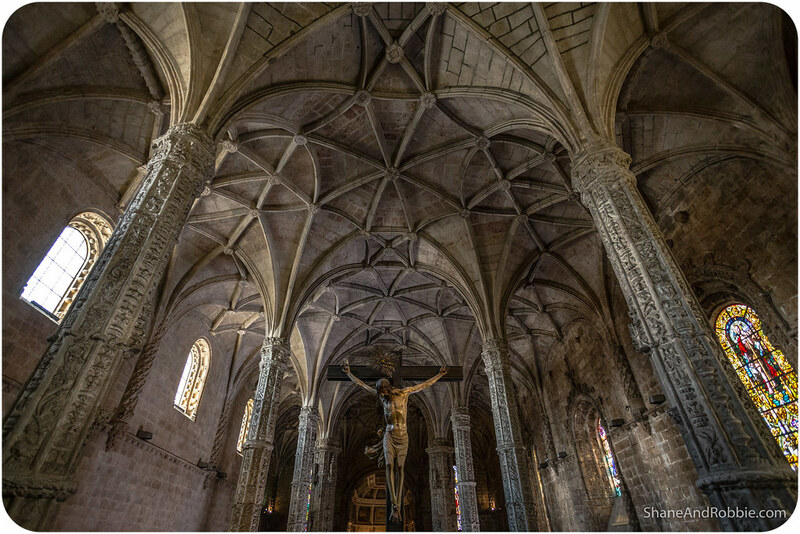 The great earthquake of 1755 that levelled half of Lisbon damaged the monastery and it’s chapel, but thankfully did not destroy them. The Hieronymites occupied the monastery for 400 years until the dissolution of the monasteries in 1833, when the building became state property. It was used as a college and, later, an orphanage, until 1940 when it was opened to the public as a tourist attraction. 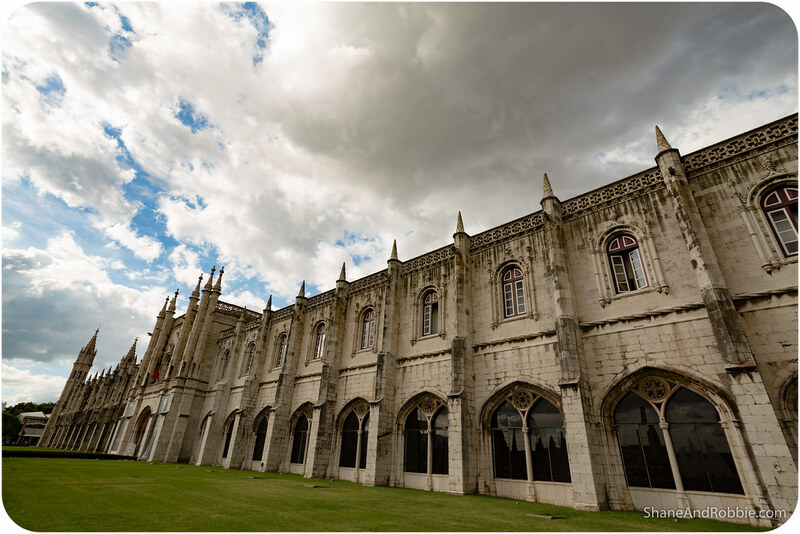 There’s a lot more to see in Belem than these few sights – including a remarkable number of museums, a former royal palace, and a café famous for its Portuguese tarts. By the time we had finished exploring the monastery, however, it was late and we were ready to go foraging for dinner. So we headed back to the centre of town and found a likely looking place along one of the pedestrianised streets in the Baixa (i.e. The Low Town). The food was good, though ridiculously over-priced (for Portugal), but that’s what you get for eating in the touristy* part of town right?! 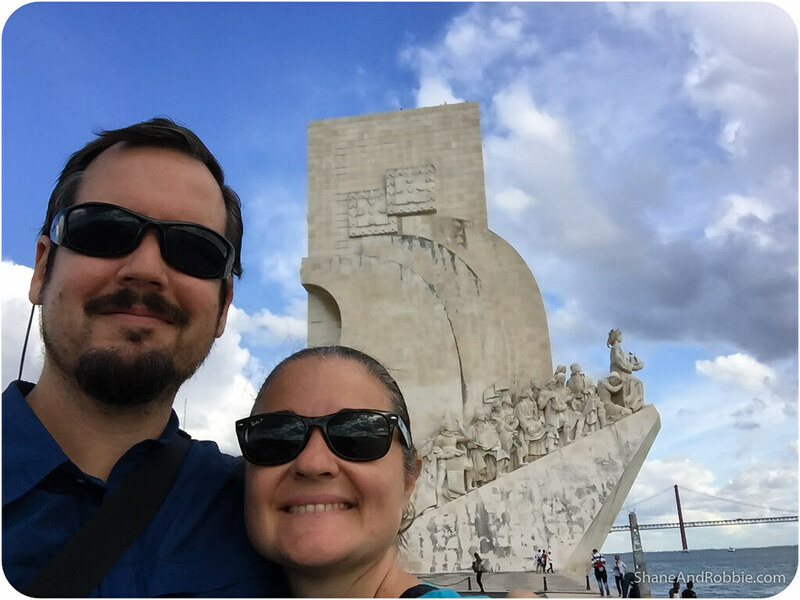 *We’ve actually been quite surprised by how touristy Lisbon is. Turns out tourism is booming here, with cruise ships by the dozen pulling in every week and budget airlines offering cheap fares bringing in thousands more visitors. Everywhere we went in Belem today the crowds were significant, and it’s pretty obvious when you’re in a “local” part of town vs. a touristy one (the prices are almost double for starters). 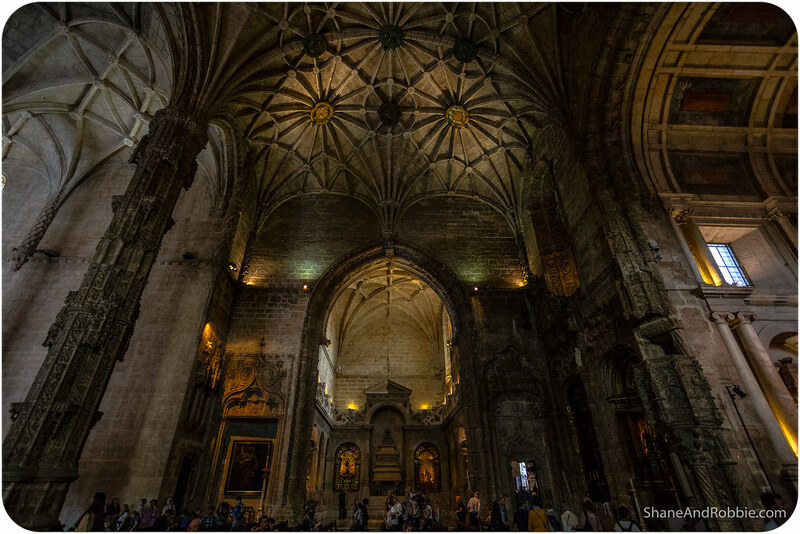 Still, Lisbon doesn’t seem to have been spoiled by all the visitors… YET. We can only hope the city manages to retain its unique spirit even in the face of mass tourism. Replete and content we ambled back to our guesthouse after dinner, already looking forward to tomorrow and eager to see more of Lisbon. Beautiful photos! 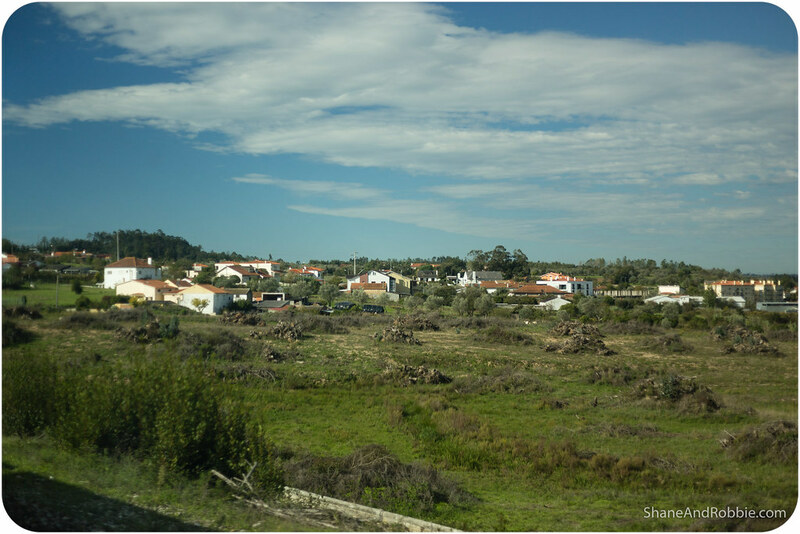 Are you visiting Sintra? If you like sweets, don’t forget to try some queijadas and travesseiros! Oh how I enjoyed seeing your wonderful pictures and reading your thorough and informative narrative on Belem. In Mid May we will be taking a 10-day tour of Portugal and thankfully getting to see the highlights you mention. This has been a first class introduction for me. Thank you!